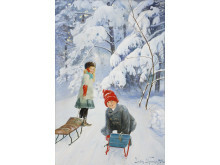 Jenny Nyström (1854 – 1946), one of our best-loved 20th-century artists, is often called “the mother of Santa”. 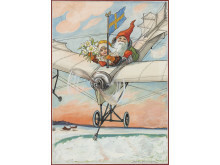 As a young woman, she illustrated Viktor Rydberg’s story “Lille Viggs Äfventyr på Julafton” (Little Vigg’s Adventures on Christmas Eve), thereby informing the Swedish notion of the Christmas elf. 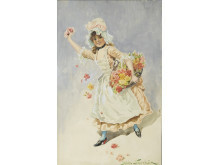 She was also a skilled painter, and the quality of her early academic works earned her a gold medal, a scholarship for studies in Paris, and the opportunity to exhibit at the Paris Salon in 1884. Unlike many of her friends at the Royal Academy, Jenny Nyström had no family to support her, and this guided her professional choice. She decided to become a children’s book illustrator – a profession that didn’t really exist in Sweden at that time Jenny Nyström was eventually followed by many other women illustrators, but she was one of the very first and can be regarded as a pioneer. 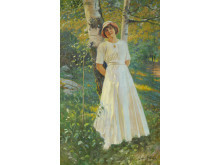 Jenny Nyström´s love of children and memories of a happy childhood in Kalmar shaped her unique style. 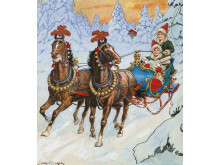 She created an overwhelming output of thousands of book and magazine illustrations for kids and adults as well as greeting cards for Christmas and Easter. 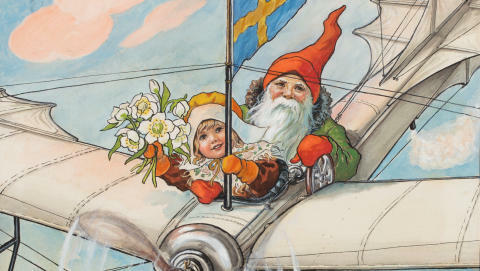 Jenny Nyström became one of Sweden’s most prolific postcard illustrators and was able to support her family throughout her life. The exhibition at Sven-Harrys konstmuseum (26 October, 2018 – 17 February, 2019) features some 100 works by Jenny Nyström, covering the period from the Royal Academy to her very last illustrations. 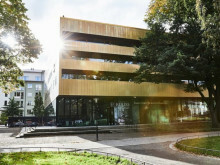 Some of the works have never been exhibited before.Thanks to the generosity of private collectors, these works will finally be shown to the general public.